While we were working in the wild to figure out the technical aspects of delivering wild images we'd arrive by seaplane very early in the morning. We'd often see ourselves being observed by Grizzlies feeding on the seabeds looking for clams and other food sources. As we came to know some of the characters in this unique biosphere, we confirmed with the local guides that these creatures had their own social hierarchy and that each one, large or small, had his own unique personality. Based on our own adventures in the wild and the experiences of others we wanted to capsulate the characters of the bear valley into human characteristics. Hank the baby bear does exist. He did almost die when he wandered away from his mother and was attacked, more than likely by a male bear. Mother bears won't go into heat until after their young leave, often two to three years. If they lose their young, they immediately go into heat. Often males will attempt to kill a mother bear’s young so she has to always be on her guard. 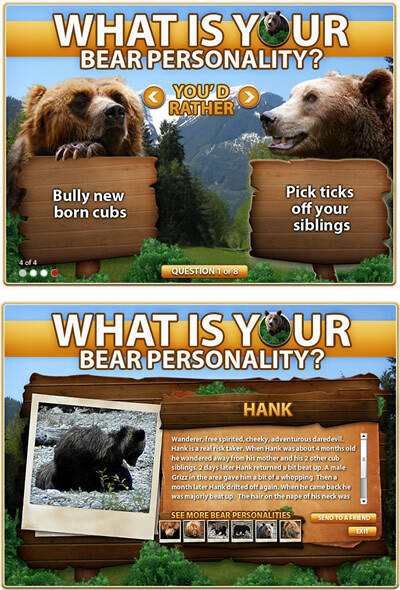 We created the "What is your Bear Personality" to give people young and old an education about the Grizzlies in the valley, but also to realize that there is a social structure to wild creatures and that we are only guests in their fascinating world.